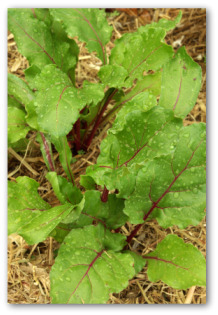 Tips for mulching a vegetable garden including how much, when, and why to mulch your garden. 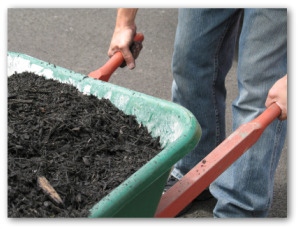 Use compost as mulch layered on the topsoil to provide a slow-release organic fertilizer when growing vegetables. Use mulch in the garden to retain water in the soil by preventing evaporation, and to help control weeds. One of the obstacles gardeners' face which may seem like an uphill battle is persistent weeds. Mulching a vegetable garden is an ideal way to win the fight. Pulling pesky weeds is no ones idea of a fun task! 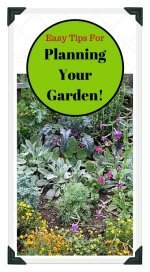 However, it is a necessary gardening chore to remove the invaders who are competing with your plants for essential space, sunlight, water, and nutrients. 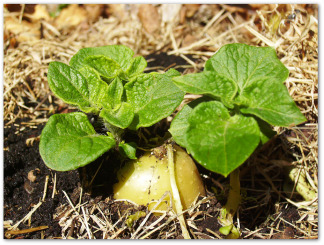 Mulching a vegetable garden helps you to control a weed population without resorting to herbicides. 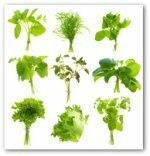 If an herbicide is used excessively or too often, the chemicals may also kill your desired plants indiscriminately along with the undesirable weeds. Furthermore, there is evidence that herbicides impede root development of plants. 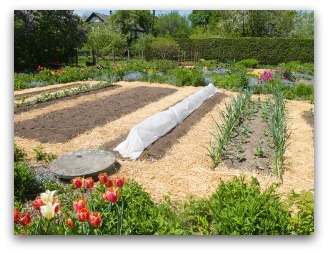 Providing the garden bed with organic mulch is the best non-chemical solution to prevent weed problems. • Mulch layered five or six inches deep not only controls weeds but it also makes the existing weeds easier to pull. 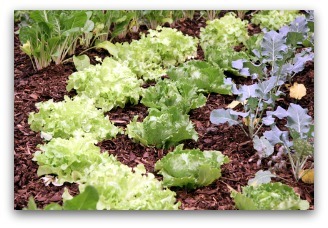 • Mulching also reduces water evaporation, which increases the garden soil moisture. • The protective covering of mulch can make an attractive addition to the landscape as well. • Generally, organic mulch made from compost improves soil structure, fertility, and insulates plants from extreme weather conditions. 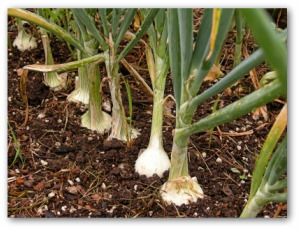 • Mulching with organic compost can provide a slow-release vegetable garden fertilizer to your garden plants, while offering the added benefits of retaining moisture and controlling weeds. 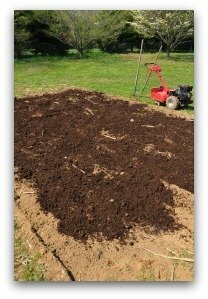 Mulching is an important part of vegetable garden soil preparation. Mulching a vegetable garden helps prevent erosion, helps retain moisture, and at times, conditions and enriches the garden bed soil. Commonly used organic mulch materials include: compost, bark, cocoa bean hulls, grass clippings, peat moss, pine needles, and sawdust. In mild winter areas, apply mulches after the ground has warmed up in the spring. Dig in the mulch in late autumn. In cold winter regions, the garden area should be mulched with thicker layers and applied before the first frost. Spread a new layer of mulch in the vegetable garden just before the peak of summer heat. Mulch must be at least three inches deep to hinder weed growth. Cover the soil in between rows with black mulching plastic. Mulches attract earthworms and other organisms which provide nutrients to the soil and loosen the soil's structure. By contrast, un-mulched earth is considered biologically dead. Weed and water the vegetable garden before mulching. Fertilizer should be applied beforehand as well because organic materials decompose more quickly under a layer of mulch. Trying to fill piles of autumn leaves into trash bags can be a frustrating chore unless you have helping hands! If all your fall helpers have scattered, cut the bottom out of a cardboard box and insert it in the bag to help keep it open. Gather the leaves as soon as possible before they get wet and damage your yard. Tie up the bags and make a bowl-shaped area at the top to collect rainwater. Make a few small holes around the bottom and sides of the plastic so that water can seep in and beneficial insects can creep inside. After leaving the bagged leaves to sit for an entire year, you will have splendidly rich mulch called leaf mold for mulching your vegetable garden. Deep-rooted weeds such as Canada thistle and European glorybind are especially difficult to combat. Their roots can burrow as deep as ten feet! A winning strategy calls for the roots to be completely dug up before they are given the chance to grow. Mulch provides the plants with a fertile, well-conditioned garden soil that is much more productive.